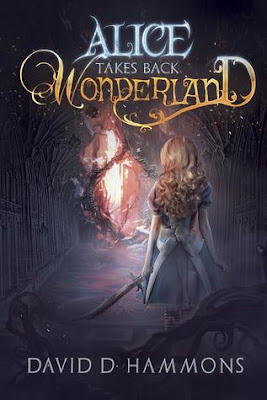 ALICE TAKES BACK WONDERLAND is a standalone novel that mashes up different fairy tales and stories from Wonderland, Neverland, and the land of Grimm. While the "original" Alice Lewis in Carroll's Alice's Adventures in Wonderland was from 19th Century, this Alice is from 21st century Missouri in the USA. The story starts with 7-year old Alice being charged with terrorizing Wonderland, and subjected to beheading by the Queen of Hearts. Thanks to Cheshire Cat and the White Rabbit, Alice returns home to a world that believes she's lost her mind. 10 years after escaping Wonderland and returning home and facing her own doubts about what she went through, Alice, now Seventeen, is forced back to where it all began by the White Rabbit. Did you know that fairy tales are real? An entirely different Wonderland awaits Alice's return. You see, the Ace of Spades is now the ruler of the land and has taken the wonder and admittedly strange out of those who live in Wonderland. He even goes as far as to ban the use of the word Wonderland from ever being spoken again. He wants something more modern and needs Alice's help at coming up with the proper name. Wonderland is turning into Alice's world, albeit a strange and bizarre version of it. Not the version that 7-year old Alice had her grand adventures in. Thanks to the Mad Hatter, the leader of the resistance, Alice is sent to the "second star to the right, and straight on till morning." Alice is supposed to travel to Neverland where she can start building up her own army to retake Wonderland. Alice soon meets Peter Pan and the lost boys who become her friends and allies. There is also the appearance of the villainous Captain Hook, and a steam driven character named Pinocchio. Pinocchio, in fact, is one the stars of this story next to Alice. With the recommendation of Tinker Bell, Alice needs to awake Sleeping Beauty and the only way to do that is to travel to the land of Grimm and ask for the Queen's help. Here we find Robin Hood and the Merry Men, Snow White and the Seven Dwarves, Cinderella, and Red Riding Hood to name just a few. ALICE TAKES BACK WONDERLAND has to be one of the most imaginative retellings of Alice in Wonderland that I've read in a long time. The whole idea of echoes from the human world and fairy tale world intermingling to create factual is really something that I haven't seen sine Once Upon A Time. Hammons goes above and beyond what any of the previous books have done. Alice is not a Mary Sue character. She's focused on saving Wonderland, and makes some interesting allies in the process. Hell, even Olympians, King Arthur, and Davy Crockett make an appearance to help save Wonderland! I dare OUAT to that! OK, seriously, who doesn't love a re-telling that adds a bit of flair to it? Who doesn't love a heroine who finds her courage, strength, and saves the day while also finding a bit of a romance with the boy who never wanted to grow up? Loved the world building. Loved Peter Pan, and most especially Pinocchio. LOVED ALICE TAKES BACK WONDERLAND!!! I love that this is a darker take on the tale! Agreed. Really a fun adventure! Oh I love the idea of this one and I confess that I'm really curious now! Plus I just love the cover! Great review! I've actually read both series/books that you are referring to. Thanks for the suggestion though! Shelly I love retellings and this sounds fabulous. Thanks for the great review! You are most welcome, Debbie! Ohhh yes, I'm going to grab this one. I <3 Alice in Wonderland retellings! Very cool! Let me know if you liked it or not! This sounds like a really fun version of Alice. I like that it includes Peter Pan and all sorts of other characters we all know! I've had my eye on this one for some time. I'm hoping to read at least 3-4 Alice inspired stories before the year is out. I'm reading one now, though it's not adventurous yet. I'll have to get this one soon. Great review! Oh a mashup of fairy tales..this sounds like fun. The cover is wonderful! Huh? This is my first encounter with this one, and I am curious. AIW was never one of my favs, but I think I would like this darker version and I want to see how the author mashes up the fairy tales, thanks for putting this on my radar. It had me at Alice in Wonderland, anything related I love, will check this out!!! Curiosity Quills has a lot of cool fantasy pieces, they're fast becoming a favorite... it's cool that this is standalone and a decent adaptation. Plus the crossover with Peter Pan? Wild but I see it worked! Oh, I adore Peter Pan, and Alice. It's too bad its a standalone, but I'm okay with that. Oh that sounds really good. I haven't read a book sounding like this one in quite a while. First of all, I'm always down for a darker re-telling, and this just sounds so good. I've actually seen some pretty good reviews rolling in for this one, which makes me more excited to pick it up. I feel as though they're are sooo many re-tellings being done, and quite a few have disappointed me this year, so it's nice to hear that this one delivers! I loooooveee dark retellings! You can definitely do so much more than light and happy! I love the idea of a different take on Alice in Wonderland. I will definitely be looking this one up. OMG, this has everyone in it! I love the mash up. And the cover. This performance was. [read more]AJBlog: About Last NightPublished 2018 12 28Almanac: Dawn Powell on long lasting marriages asked me about the long marriage to Joe [Gousha, Powell recently deceased husband] years I reflected that he was the only person in the world I found it always. [read more]AJBlog: About Last NightPublished 2018 12 28Warring with Warhol: What I Most ( Least) Appreciated About the Whitney's RetrospectiveAlthough I gave Andy Warhol A to B and Back Again (to Mar. Search for:Bulimia NervosaSigns, Symptoms, Treatment, and Self Help Many of us turn to food when we feeling lonely, bored, or stressed. But if you have the eating disorder bulimia, overeating is more like a compulsion. And afterwards, instead vegan shirts of eating sensibly to make up for it, you his and hers shirts punish yourself by purging, fasting, or exercising to get rid of the calories.